Whew! We dodged a bullet… at least for another year. If you are not familiar with what the 2019 W-4 form could have looked like, then keep an eye out for a future article where we will give it a thorough review as it is now postponed for 2020 by the U.S. Treasury. The new 2019 W-4 form has been published (including the Spanish W-4(SP) version) and not much is changed from the 2018 version. A Form W-4 remains in effect until the employee gives you a new one, so you do not need to obtain a new form each year. When you do receive a new form, begin withholding no later than the start of the first payroll period ending on or after the 30th day from the date when you received the replacement. This means you may have forms for active employees that are as old as they are employed, but they are still valid. Only in the case of an employee claiming EXEMPT, as written in on line 7 of their withholding allowance certificate, must they complete a new form each year. If they do not complete a new form by February 15th, then you must withhold as if they were Single and claiming no withholding allowances, or use the last form received from the employee that was not Exempt. 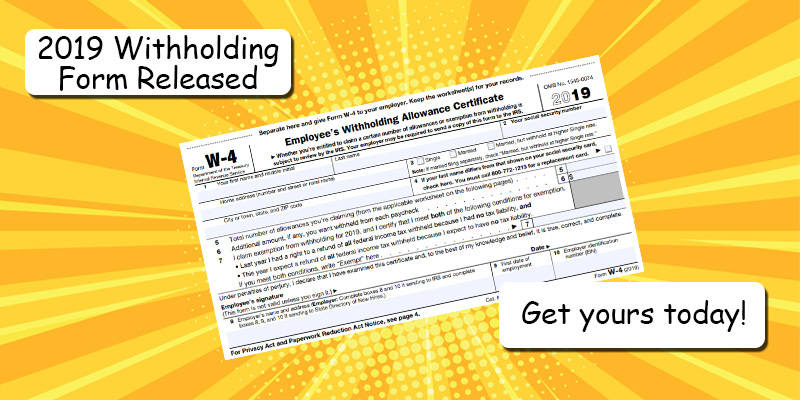 Do you have the proper State Withholding form for your employees? If you have employees only in these states, then you do not need to read any further, as these 9 states do not have state income tax withholding; Alaska, Florida, Nevada, New Hampshire, South Dakota, Tennessee, Texas, Washington, Wyoming. While many states have their own withholding form, there are a number that accept the Federal W-4. Here is a list of states that accept the federal form; Colorado, Delaware, Idaho, Montana, Nebraska, New Mexico, North Dakota, Oklahoma, South Carolina, Utah. That leaves the majority of states/territories (30+) requiring the use of their own state specific form. NEW for 2019! Oregon has its own version, the OR W-4 and the state is encouraging its workers to complete this new form as they believe the status on the federal form may not lead to sufficient state income tax withheld. What if the employee does not complete a state form? Here is a summary of what should happen in each state. The following states follow the federal rule to withhold as if the employee was single with zero withholding allowances: Alabama, California, Colorado, Delaware, Hawaii, Idaho, Kansas, Maine, Minnesota, Missouri, Montana, Nebraska, New Mexico, North Carolina, North Dakota, Oklahoma, Oregon, Rhode Island, and Utah. The following states, and the District of Columbia and Puerto Rico, say to withhold as if zero allowances were claimed: Illinois, Indiana, Iowa, Kentucky, Michigan, Mississippi, Ohio, South Carolina, and Virginia. Arizona requires withholding at 2.7% of gross taxable wages. Arkansas advises employers to either withhold as if zero exemptions or dependents were claimed, or to use federal Form W-4. Connecticut says to withhold at the highest marginal tax rate (6.99%) without allowance for exemption. Georgia says to withhold using a single filing status with zero allowances claimed, or to use federal Form W-4. Louisiana advises employers to withhold as if zero exemptions or credits for dependents were claimed. Maryland says to withhold as if one exemption was claimed. Massachusetts, New Jersey, New York, West Virginia, and Wisconsin advise employers to withhold based on federal Form W-4. Vermont advises employers to withhold based on federal Form W-4, and if the federal Form W-4 indicates an additional amount of federal withholding for each pay period, the Vermont withholding should be increased by 24% of the extra federal withholding. For those companies that utilize PayMaster HCM for your payroll, our system maintains each states’ form and will present the employee with the appropriate form to complete based on where they live and work taking the hassle out of form tracking. All employee completed forms are also stored in the system for easy retrieval for any IRS request/audit. If you are not utilizing PayMaster HCM, then give us a call to show you how the system can simplify this and other tedious processes.